Gyáa'aang is the Haida language word for the tall red cedar poles carved with images from family histories on the northern Northwest Coast. These heraldic columns have come to be called "totem poles." John Wallace, a Haida pole carver, told Viola Garfield that the translation of the word gyáa' aang is "man stands up straight," a descriptive rather than literal translation. The term "totem pole" is not a native Northwest Coast phrase. In fact, the use of the term "totem" to refer to the Northwest Coast images of family crests or emblems is not strictly accurate. The word "totem" itself derives from an Ojibwa word, "ototeman," and "totemism" in anthropological terms refers to the belief that a kin group is descended from a certain animal and treats it with special care, refraining from eating or hunting it. The figures carved on Northwest Coast poles generally represent ancestors and supernatural beings that were once encountered by the ancestors of the lineage, who thereby acquired the right to represent them as crests, symbols of their identity, and records of their history. Several different types of these monumental poles include: tall house frontal poles placed against the house front, often serving as doorways of houses with the entrance through a hole at the bottom; carved interior house posts that support roof beams; free standing memorial poles placed in front of houses to honor deceased chiefs; and mortuary poles made to house the coffins of important people in a niche at the top. Tall multiple-figure poles were first made only by the northern Northwest Coast Haida, Tlingit, and Tsimshian peoples in Southeast Alaska and British Columbia. Large human welcome figures and interior house posts were made by the Kwakwaka'wakw and Nuu-chah-nulth people further south, and the Coast Salish people in Southern British Columbia and western Washington also carved large human figures representing ancestors and spirit helpers on interior house posts and as grave monuments. Many Years ago the Haidas used to live at North Island. It stormed for many days and the people ran out of food. They couldn't go out and hunt or go fishing on account of the storm. One day it cleared up and all the people moved to the West Side to fish for halibut. All the people left excepting the chief's sister. The chief's sister was very old. The chief said she wouldn't have any more children, so he wanted to leave her behind in the village alone so that she would starve and not eat up needed food. He gave orders to the people to put out their fires before they left so his sister would have no fire. This her grandchild heard, so she got a clam shell and put coals in it and buried it for her grandmother. This she told her while no one was around. After everyone left the woman went after the clam shell and started her fire with the coals. After she started her fire she looked up in the sky and asked for help. While she still stood on the beach she saw an eagle coming toward her with something in his beak. He dropped it down to the old lady. It was a red cod. The second day the eagle brought a halibut, the third day a seal and the fourth day a porpoise. Before the old lady could get the porpoise a bear came down and took it. The eagle brought her many things and the bear would get it before she could. She got tired of it and asked for a child to protect her. Long time ago they used to be afraid to say anything carelessly about the air. It was just like believing in God now. That night the old woman felt her left leg itch all night. Toward morning she felt a head, then she realized that she was having a baby. She was afraid it would run away so she grabbed its legs. The child learned to talk in a month and in six months he was a big boy. One night the boy dreamed of a man. This man was showing the boy how to make a bow and arrow in his dream. He told the boy to make one so he could kill the bear that was taking the old woman's food. When he woke up the next morning he started to make the bow and arrow. When the bear came out again he killed it. The next night he had another dream. The man came again and this time his finger and toe nails were painted with human faces and his chest and whole body were tattooed. He told the boy that when they went to bed the next night neither he nor the old lady should open their eyes until they were sure the sun was up, no matter how much noise they heard. The next night as soon as they went to bed they heard loud noises which lasted all night. When they thought the sun was up they opened their eyes. They were in a large house. It was carved inside and when they went outside there were three totems on the front and the front of the house was carved. There was one totem on each corner of the house and one in the center by the door. Those were the first totems ever seen. They couldn't believe their eyes when they looked at the house. The next day they found a large whale on the beach. They cooked every bit of it and put it in square boxes, the old fashioned oil or grease boxes. In the meantime the chief began to think of his sister and sent a slave back to bury her body, for he thought she had starved by this time. When the woman slave landed on the beach she was surprised to see a big house in the old deserted village. She was also surprised to find the little boy living with the old woman. The chief's sister took her in and fed her, but told her not to save any of the food that she gave her. The slave disobeyed and hid a piece of seal meat in her blanket. When she got home in the evening all were in bed, but there was a little fire left. She fed the piece of seal meat to the baby. After the child was through she threw the left over meat in the fire and it burned brightly. The chief asked her what it was and she then told them about the carved house full of food. The next day all the people went over to North Island to see the old woman. The chief dressed his nieces and they painted their faces for he wanted the boy to marry one of them. Only the girl who had left the coals was not painted. She was considered too poor to marry the wealthy chief's nephew. They came into shore and the young man wanted only to marry the girl who had saved his mother. That is the end. Only the best artists were commissioned to carve the monumental heraldic poles that were placed in front of and inside northern Northwest Coast houses proclaiming the identity, status, and history of the noble people who owned them. In ancient times, few noble families could afford to commission these sculptures, but during the nineteenth century the number and size of poles increased dramatically due to a variety of factors, including the increased wealth brought by the fur trade, improved availability of iron tools, and the dynamic social and political environment characterized by new wealth, population loss, family relocations, and chiefly rivalries. The use of the multi-figure poles spread rapidly along the coast to the Nuxalk (Bella Coola), Heiltsuk (Bella Bella), Kwakwaka'wakw (Kwakiutl), and Nuu-chah-nulth (Nootkan) peoples. Historic photographs taken in the late nineteenth century on the northern Northwest Coast, especially at Haida villages on the Queen Charlotte Islands and in Southeast Alaska, show the famous "forests of totem poles" in front of the houses. However, by the end of the 1800s, after over a hundred years of contact with people of European descent, explorers, fur traders, missionaries, government agents, colonists and anthropologists, most of these totem poles were gone from the northern Northwest Coast. In the late 1800s most tribes ceased to carve these monumental poles when the potlatch, the ceremony held when poles were raised, was made illegal in Canada. Nevertheless, some families, especially the Kwakwaka'wakw people at the north end of Vancouver Island, continued to potlatch in secret. They carved and raised poles and made many masks to use at these ceremonies. During this time, Indian agents and missionaries discouraged the carving of new poles and the associated ceremonial activities, and people began to move from their old clan houses into single-family frame houses located near fish canneries, lumber mills, and trading posts. Very few old poles still stand in their original locations today. Many of the poles were taken or sold to museums and collectors around the world, others were allowed to decay, or cut down and chopped up. Ironically, it was during this same late nineteenth period when old poles were disappearing from Native villages and the people were not allowed to raise new ones, that totem poles became a powerful symbol of the Northwest Coast to outsiders, largely through the tourist industry which brought many visitors to the Northwest Coast on steam ships in the 1880s and 1890s. At this time Native artists began to carve small model poles for sale as souvenirs to tourists. Full-sized totem poles were brought to large international expositions such as the Centennial Exposition in Philadelphia in 1876, the World's Columbia Exposition in Chicago in 1893. John Brady, the governor of Alaska, acquired several Tlingit and Haida poles in Southeast Alaska that were exhibited at the World's Fair in St. Louis in 1904, and later at the Lewis and Clark Exposition in Portland in 1905. Most of these poles were later returned to Sitka, Alaska, where they were erected in a public "Totem Park" that was established as a national monument in 1910. In 1899, a group of Seattle businessmen took a trip to Southeast Alaska and stopped in the Tlingit village of Tongass. They assumed that the village had been abandoned and proceeded to remove a large pole that was taken back to Seattle and erected in Pioneer Square. In fact, the Tongass people were just away at their fishing camps, and when they returned, they were unhappy to find the pole stolen. The thieves had been observed, and their actions were reported to Governor Brady in Alaska. The Tongass people asked for the return of the pole or payment for it. After lengthy negotiations, a payment was made, but the pole remained in Seattle. This pole was damaged by fire in Pioneer Square in 1938, and a replica was carved by a group of Tlingit carvers from Ketchikan as part of a Civilian Conservation Corps project. 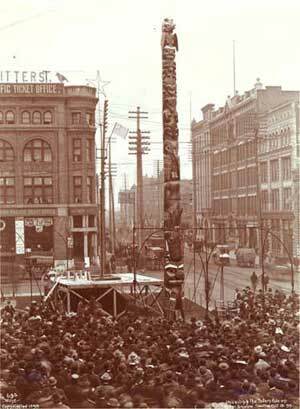 This replica pole still stands in Pioneer Square in Seattle today. Poles were often "copied," that is, new versions were commissioned when new houses were built, or when members of the family married and moved to other villages. 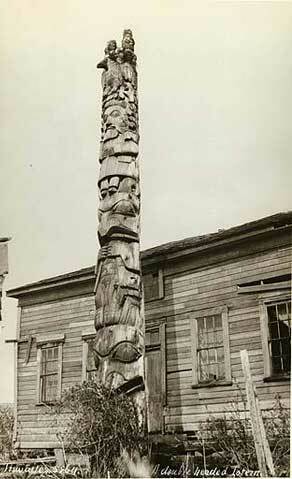 An earlier copy of this Tongass pole had been raised by David Hunt in front of his house at Fort Rupert, British Columbia, in honor of his grandmother. He was the grandson of Anisalaga, Mary Ebbetts Hunt, of the Ga.nax.ádi Raven clan, a Tlingit noble woman who was one of the original owners of the pole in Tongass. She married Robert Hunt, a Hudson's Bay Company trader at Fort Simpson, and later moved with him to Fort Rupert. The original pole was raised around 1870 in Tongass as a memorial to Anisalaga's mother. The pole commissioned by David Hunt was carved by Charlie James in the Kwakwaka'wakw style, but with the same figures that were on the Tongass Tlingit pole. Mary Ebbetts Hunt explained the meaning of the figures on this pole to her son, George Hunt. At the top is the Raven with the moon in his mouth. This figure identifies the owners of the pole as Ravens and relates the story of how Raven stole the sun, moon and stars from a rich man who kept them hidden in a box (See also: Jay Miller's essay "Alaskan Tlingit and Tsimshian".) Below the raven is a woman with a frog. They represent the story of a Ga.nax.ádi woman who teased a frog and was carried away to the frog town where she married and had two frog children. She escaped by sending her two sons back to the house of her father to fetch a bone for the piercing of skin. They had her father break a dam in order to drain the lake where the frog village was located, killing all of the frogs except her two sons. The figures at the bottom of the pole all relate to another Raven story. Below the frog is Mink, Raven, then a whale with its head pointing downward. At the bottom is the Chief of all Birds. Raven took Mink along as his companion, and they were swallowed by a whale who took them across the water as a favor. The whale invited them to cut pieces from his blubber for food, asking only that they avoid his heart. The whale drifted ashore at Rose Spit on Haida Gwaii (the Queen Charlotte Islands). The people outside cut a hole for them to escape, and Mink jumped out all covered with oil. He rolled in rotten wood, giving his fur the appearance it has today, and Raven did the same thing. Raven and Mink walked around Haida Gwaii and found a big house. Inside lived a man with a bird beak who was the Chief of all Birds. Raven considered himself the Chief of all Ravens, and the Chief of all Birds was not pleased with him, and so he turned him into the ordinary Raven we know today. In order to be sure of the meaning of the figures carved on Northwest Coast poles, it is necessary to know what the owner's history is. There are other versions of similar stories that are used by different Tlingit, Haida, and Tsimshian families on their own poles, each being the property of different lineages. Often, people misinterpret the figures on poles when they do not know the history of the pole. ...who was a famous woman of the Eagle clan. She went out for salmon eggs one day, and when she drew up her canoe on the beach upon her return, she had several baskets filled. Not seeing her two little children, she called to them, but they ran and hid. Later she called them again, and they answered her from the woods with the voices of crows. Her worst fears were realized when she found that a white man, "a Boston man," had carried them off in a ship. These two orphans never returned to their people. Such is the simple kidnapping story that has been handed down in Skolka's family for generations, and this whiskered face on the totem pole is said to be almost the only instance of a Boston man attaining immortality in these picture-writings (p. 274). The details of this story may have been forgotten by the 1940s, when a different explanation of this pole was given to Viola Garfield by John Wallace. He said that the two human figures on the top were from Skulka's wife's father. The eagle was from Skulka's wife's uncle's line, and that they simply chose to use the "white eagle instead of the old carving." He identified the European figure as a White Russian from Sitka, perhaps the first white person seen by the Haidas. The bird was identified as an Owl from Skulka's clan. This crest was acquired by Skulka's family when his ancestors were out getting fish. It was getting dark and Owl called out to make night, so they took him for a crest and the man was changed into an owl. The owl on the pole has feathers and human hands, showing that he had not fully changed into an owl. At the bottom is a brown bear. A different explanation was also recorded by Viola Garfield, which says that the "Russian" was put on the pole because Russians took the land away from the Indians and did not pay them. The eagle stands on the Russian's head to hold them down until the land is paid for. Whether the European figure represents a "Boston Man" or a "Russian," it is probable that it was put on this pole as a "ridicule" figure proclaiming that a debt had not been paid, either for the stolen children or the stolen land. During the 1930s, the U.S. Federal government funded the creation of several "Totem Parks" in Southeast Alaska and hired Native carvers to move several old poles from their village sites and carve replicas that were erected in these parks, located in Saxman, Ketchikan, Klawak, and Hydaburg, Alaska. As the prominence of the totem pole as a symbol of the Northwest Coast spread, their use also spread to neighboring tribes, and during the late twentieth century, many southern Northwest Coast tribes have adopted the form of the northern carved poles to their own use. In some cases, totem poles have been used as symbols of all North American Native peoples, and indeed, Cherokee, Ojibwa, and Seminole carvers have produced small model totem poles for sale all across North America, despite the fact that there was no ancient tradition for this art form among their people. Many non-native souvenir factories have also mass produced model totem poles for the souvenir industry, both in North America and Japan. These small mass produced models are often based on the form of just one or two original poles. Many of the model poles that have a thunderbird with outstretched wings at the top standing on the head of a grizzly bear are based on two Kwakwaka'wakw house posts from the Nimpkish village of Alert Bay, British Columbia. It was not until 1951 that the anti-potlatch law was dropped. After this time, Native people in Canada could openly potlatch, and many new big houses were constructed for community ceremonial use, with fully carved house posts and tall poles in front. Museums in Vancouver and Victoria, British Columbia, hired Native carvers to create new poles for their totem parks in the 1950s and 1960s. Carvers such as Ellen Neel and Mungo Martin worked to educate the public about the art form of totem poles by carving high quality model poles for sale, and replicas of old poles for museums. In recent years, Northwest Coast carvers have been commissioned to carve full-sized poles for many museums, corporations, and private collectors, world-wide. Today, Native people throughout the Northwest Coast are carrying on their traditions by raising new poles to honor deceased relatives and celebrate family histories and important events in their lives. 1929 Totem Poles of the Gitksan. Ottawa: National Museums of Canada Bulletin 61. 1950 Totem Poles (2 Vols). Ottawa: National Museums of Canada Bulletin 119.
n.d. Viola Garfield's Field Notebooks. University of Washington Libraries, Manuscripts and Archives Division. 1980 The Seattle Totem Pole. Seattle: University of Washington Press. 1948 The Wolf and the Raven. Seattle: University of Washington Press. 1981 Totem Poles: an Illustrated Guide. Vancouver: University of British Columbia Press. 1992 Where the People Gather: Carving a Totem Pole. Seattle and Vancouver: University of Washington Press and Douglas & McIntyre. 1963 Monuments in Cedar. Seattle: Superior Publishing Co.
1983 Haida Monumental Art. Vancouver: University of British Columbia Press. 1983 Ninstints: Haida World Heritage Site. Vancouver: University of British Columbia Press. 1984 The Totem Poles and Monuments of Gitwangak Village. Ottawa: National Historic Parks Branch. 1986 Totem Poles of the Pacific Northwest Coast. Timber Press. 1982 The Totem Carvers: Charlie James, Ellen Neel and Mungo Martin. Vancouver: Panorama Publications. 1885 Alaska: Its Southern Coast and the Sitkan Archipelago. Boston: D. Lothrop Company. 1975 The Totem Poles of Skedans. Seattle: University of Washington Press. 1984 Cedar: Tree of Life to the Northwest Coast Indians. Seattle: University of Washington Press. Does your family have any symbols of their identity or records of their history? What kinds of ceremonies does your family have to honor relatives or celebrate important events? Are there any examples of totem poles in your community? What is the purpose of these poles? How are they similar or different from poles in Native Northwest Coast communities? 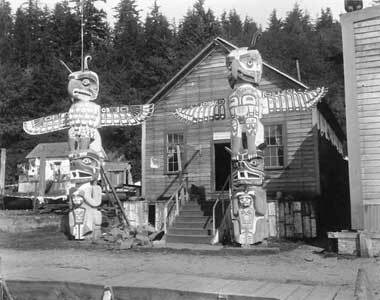 Look at historical photographs of totem poles in different villages on the Northwest Coast. Find examples of the different kinds of poles: house frontal poles, house posts, memorial poles, mortuary poles. What similarities and differences in village or tribal styles to you see in these poles? Locate images of totem poles in the popular media, magazines, newspapers, advertisements, commercial logos, movies, etc. How are these images used as symbols of Native Americans, and what messages do they convey? In what way might these images be stereotypes? How can we know how old the tradition of totem pole carving is on the Northwest Coast? How is it possible to know the meanings of the images on totem poles? What are "ridicule" poles, and why were they made? Why did government agents and missionaries discourage the carving of heraldic poles? How successful were they, and how did Native people react to this effort? In what ways has the carving of totem poles changed or stayed the same? Dr. Robin K. Wright is Curator of Native American Art at the Burke Museum and a Professor of Art History at the University of Washington in Seattle. Her book, A Time of Gathering: Native Heritage in Washington State, won the 1992 Washington State Governor's Writers Award. In 2001, UW Press published her book Northern Haida Master Carvers. She won the Washington State Book Award for Northern Haida Master Carvers in 2002.